What did you like about the book? I did enjoy Durst’s zany and colorful illustrations that accompany the rather meager text comparing the narrator’s family to groups of animals. With 2 little brothers, her home life does look a bit chaotic. What if they were a “pod” of pelicans or a “pandemonium” of parrots or a “smack” of jellyfish instead? Dad’s glasses, mom’s earrings, the narrator’s braids and little brother’s bright red hair make it easy to figure out which animal is which family member. Anything you didn’t like about it? I didn’t find the animal group name concept very intriguing. I bet no one in Australia really describes the group of wombats living under a tool shed as a “wisdom” and I think everyone already knows that a bunch of fish are a school and a bunch of buffalo are better described as a herd. A final illustration imaging little brother being captured and taken off to the zoo in a cage seemed unnecessarily grim. I did like the depiction of the mixed race family, so kudos for that. To whom would you recommend this book? 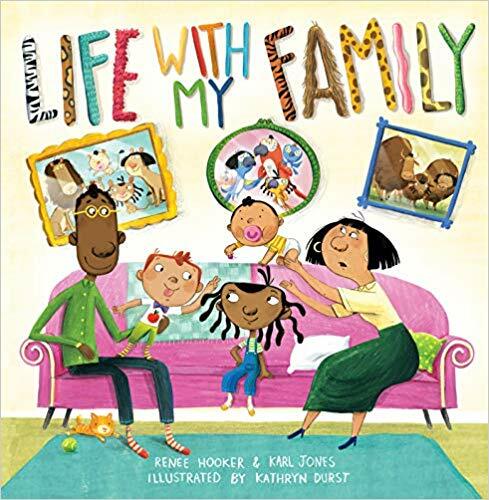 Good for schools or communities looking for depictions of mixed race families. Who should buy this book? Day care or elementary. Where would you shelve it? Picture books. This entry was posted in Book Review and tagged Penguin Random House. Bookmark the permalink.